We have already looked at some issues regarding the legalisation of gambling in South Africa, in Unit 1. Let us recap on some of the points raised there that are relevant for this Unit. Society as we have seen has been quick to criticise gambling because of the well-documented ill-effects of this activity. In addition there are elements in society that may disapprove of winners getting large amounts of money simply on the basis of luck. In most societies there is a belief that success should be linked to hard work. Other reasons why some groups in society may disapprove of gambling, is that it attracts and encourages the wrong sort of people, namely reckless risk takers with more money that sense. In addition there is often a belief that people who have weak characters may be ruined, financially and morally, through the temptation of easy money. Firstly, that gambling was a leisure activity that was considered to be desirable by a significant percentage of the population of South Africa and that as a free and democratic country its citizens should enjoy the right to choose whether or not they wished to participate in this form of entertainment. Secondly, that the significant number of illegal gambling operations in any event provided that form of entertainment to large numbers of people but that the continuation of such operations – which criminalised participants when caught – was undesirable for a number of reasons: as recently as 1995, there were about 150 000 illegal slot machines in South Africa, paying no tax, employing few people and providing a platform for associated criminal behaviour such as prostitution and the drug trade. Moreover, this vast illegal industry was almost entirely controlled by whites, offered players no protection against fraud, was accessible to minors, and ignored problems associated with compulsive gambling. We also looked at the fact that when gambling is illegal and unregulated it cannot be taxed which means that the government looses out on a potential source of revenue which it could use for the greater good of all its citizens. So let us look now in some detail, at the financial issues involved in establishing a legal gambling project, in this case, a Casino. Imagine you have been asked to write a 450 word opinion piece for your local community newspaper that outlines the advantages of allowing a Casino to be built nearby. In pairs, formulate such an article. Remember to mention the moral, social and economic reasons people may resist this, and put forward good reasons why ultimately it would be a good thing to allow the Casino to be built. A license fee (often valid for a ten year period). What happens is that Casinos bid for a license and as part of their bid, agree to fund some project of benefit to the community and society. For example, the successful Sun International Grand West bid offered to finance the construction of the Cape Town International Conference Centre and part of the canal network linking the Waterfront with the Foreshore. A provincial levy which accrues to the province against revenue earned by the Casino. Levies of this type are often charged against revenue (money passing through machines, processed at tables and so on) which is very precisely monitored by the province concerned. The decision to base the levy on revenue is because profit may be manipulated by accountants (charges/costs/expenses are not precise) and such amounts cannot be directly monitored. Such levy schemes are often tiered, that is different levies are charges according to revenue levels. They may also be license specific; for example in the Western Cape, because it was granted exclusivity, the levy table for the Cape Town Casino differs from the non-urban Casinos based outside Cape Town. Finally there is the normal corporate tax on net profit. This is a typical table for computing or calculating the provincial levy for a large casino with exclusivity. Look at Row four of the Table; if the Gross Gaming Revenue (GGR) of the casino was R500m what would the provincial levy be? In addition to the provincial levy or Tax, Casinos in SA must pay VAT on Gross Gaming revenue (net of the levy). This is a national tax and is standard across different Casinos. We first consider how the actual amount of VAT can be calculated from a vatable income stream using the following example. What is the amount of VAT paid by a casino with GGR of R500m and a levy of R49.2m? What is the total provincial levy and VAT paid? The last tax payable is corporate tax on net operating profit (we will discuss later exactly what NOP is defined as. At this point you simply need to know that it represents “taxable income”, that is revenue flows from which all expenses (costs) have been deducted or taken away. In our casino we can assume NOP is R100m. SA has a corporate tax rate of 35%, so the corporate tax is R35m. Thus total tax payable in this example is R104.56m + R35m = R139.56m, nearly 30% of GGR. In our example, we see that the Casino on which our Case Study is based, has contributed a massive R139.56m in taxes. We can see from this, that this money makes the existence of Casinos attractive for both province and government. It has been estimated that in the 2003/4 tax year the Casino industry in South Africa accounted for nearly R1.3-billion in provincial gaming taxes and VAT which, together with company tax, contributed more than R1.7-billion to government revenue – a sizable amount! Moreover, the development of a Casino creates jobs in construction (building phase) plus jobs in the hospitality business, closely allied to tourism. In addition it must be remembered that Casinos constitute a great tourist attraction. which describes how much government tax coffers benefit from the casino industry. This benefit is recognised by government! However, government is obviously still concerned about any potential negative effects on society and has to constantly weigh the positives of allowing Casinos (namely the tax revenues gathered) against any potential negatives to society (particularly problem gambling) . If we look at the economic impact of gambling since 1994, we can see that the industry has made a sizeable contribution towards capital investment, infrastructure development, tax payments and employment. The years between 1997 and 2000 saw the gambling industry making fixed capital investments of around R 10 billion, representing 2,1 percent of total South African fixed capital investment over that period. As a result of conditions imposed on gambling licenses, these investments reached beyond the development of the gambling site itself, leading to the emergence of new hotels, shopping malls, entertainment centres, and convention centres. As a result, in the 10 years since gambling was legalised in South Africa, casino resorts have added almost 6 000 hotel rooms to South Africa's tourist infrastructure. 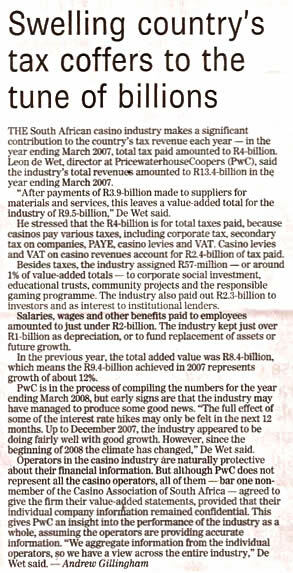 In 2005, the gambling industry contributed about R2,7 billion to government coffers, of which about R1,8 billion was provincial gaming tax and value added tax. The casino industry alone, is estimated to have created about 100 000 direct and indirect jobs. Gross gambling revenue grew from R5,6 billion in 2003, to R10,1 billion in 2006. Free market economics would dictate that the most efficient allocation of resources occurs when a competitive business environment exists. However in all, competitive environments such competition would drive down the price of gambling (drive down the “house advantage”) of Casinos and provide the cheapest form of “gambling entertainment”. Such competition would thus result in the existence of several or even many Casinos, with low profit margins. As such, the benefits to society in terms of license fees, provincial tax, VAT, and corporate tax would be considerably less in total than it would if government licensed one Casino serving a main metropolitan centre. This is exactly what happened in Cape Town, where the provincial government of the Western Cape was convinced that they should license only one casino to serve the city of Cape Town, (other licenses were given to Langebaan, Caledon, Worcester and the Garden Route). The Cape Town Casino (Grand West) has been an overwhelming success and is the most profitable of all the South African Casinos with a current (2007/8) revenue of close to R1.75 bn. In contrast Gauteng licensed six casinos in a relatively small area and these were competitive, producing much lower profit margins than Grand West and thus could only attract lower license fee and lower taxes. The first step for any group wishing to establish a Casino is to apply for Casino license. This means they have to formulate a “bid” (which consists of a detailed business plan including the benefits to society). The bid in itself incurs a considerable cost, comprising a bidding fee plus a Casino architectural model and documents detailing the expected profit and the contribution the bidding company is prepared to make to the provincial government. Some bidding processes set up by government to bid for a single casino license pre-specify the site or place where the Casino is to be located, which is generally provincial land. In the Cape Town example bidders were required to identify the site and secure an option to build a Casino on the site. Sites considered by the various bidding companies included, Goodwood Showgrounds (the current site of Grand West) Culemborg site (at the Cape Town Foreshore), Bellville site and the Century City site. The Cape Town bid was won by Sun International for their proposed casino on the Goodwood Showground site. Grand West was formally opened in Cape Town December 2000. The total investment cost was of the order of R1.5 bn and it employs around 2 500 people. It now has around 1800 video/slot machines and 80 tables and generates GGR of approximately R1.75 bn. per year (2007/8). Activity 2: What would you contribute? Imagine you are the members of a group of business people who are bidding to establish a casino, whose task is to decide on what social benefit should be included in the bid. Brainstorm a list of different ideas and then choose two possible ones. Write a short (200 word) paragraph on each outlining the benefits to the community. Gambling activities, video-slot machines and tables. These are often divided into those accessible or open to the general public (over the age of 18) and more the exclusive parts, known as Salon Privé sections which are reserved for valued clients. These may include private games of poker. Food-courts, restaurant facilities, children’s facilities and shops. For example, Grand West has an ice-rink, a children’s amusement park and a ten-pin bowling alley. Hotelier facilities. Casinos often have a hotel attached to them where guests may be accommodated. By far the largest portion of a Casino’s revenues come from the gambling activities and of these the revenue from video-slot machines in South Africa is the largest, generally comprising around 80% of the gambling revenue. The last two sources of income given above are there primarily to support the revenue generating capacity of the gambling section. Let us now proceed to consider further details of our hypothetical example used in the previous section here. 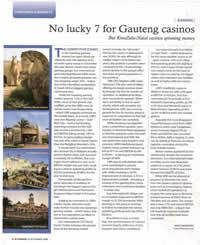 The Casino generates GGR of R500m, comprising R400m from slot machines and R100m from tables. After provincial levies and VAT are deducted (we saw previously these amounted to R139.56m) we obtain a figure of R395.44m. Direct Costs, that is, costs that are directly linked to the generation of revenue. These are usually labour or service costs such as the salaries of roulette croupiers. Note that slot machines require comparatively little direct service support (this is in contrast to table games where there needs to be one croupier per table). We assume in the following example that direct costs are 12% of revenue for slots and 40% of revenue for tables. Indirect Costs or “Overheads”; that is costs which are not directly related to revenue but are incurred independently of revenue. Examples of indirect costs are administrative electricity and security costs, which we assume are 7% of revenue. We also need to include a management fee in this category. Casinos are often managed by a company who do not directly own the Casino. Such companies charge a fee for providing a management service. We assume this fee is 3% of revenue. We are now going to look at an Income Statement and key Balance Sheet items for a hypothetical Casino in the Western Cape. If you are unfamiliar with such a thing, do not be fazed – take your time and read it slowly and thoroughly – it is all laid out in a very logical manner. When operating costs are deducted from Gross Gaming Revenue (GGR) we get Gross operating profit or EBITDA. In this case the EBITDA is R218.64m from a GGR of 500m. The gross trading margin (which is the EBITDA over the GGR) is 43.7% Casinos are generally satisfied with Gross Trading margins which are over 40%. Firstly there is the interest on the money borrowed to build the Casino, fit-out the Casino and purchase all the gambling equipment. The licensee will generally supply between 20% and 40% of the capital required to build the Casino themselves. This sum of money is known as equity capital. The remainder has to be borrowed from a bank and constitutes debt to the bank. In our example, the owner puts up one third (1/3) of the capital as equity capital and borrows two thirds (2/3) of the capital from the bank. The debt incurred to the bank in this example therefore, is R450m. The higher the proportion of capital required, the higher the so-called “gearing” of the project; the higher the gearing, the higher the return on the project for the entrepreneur (because he or she is putting in less of his or her own money), but the higher the risk for the bank! Entrepreneurs will often want to borrow as much capital as possible so that they put a minimum of their own capital at risk. Banks, however, will always want the owner to put up as much capital as possible into the project so that their (the bank’s investment) is at less risk. If the bank lent a very large proportion of the capital (say 95%) and the project went bankrupt the bank would have to try and recover almost the entire cost of constructing the Casino and that might well prove very difficult. The recent so called credit crunch of 2008 was all about banks lending too high a proportion of the capital required for people to buy domestic houses in the USA. What happened then was, when the owners had difficulty paying the loans back, the banks were forced to try and recover their money, often by auctioning off the house. However, in a weakening house market, banks lost billions of dollars in the process and as you may know, several large investment banks went bankrupt. The interest on the debt of R450m borrowed from the bank is assumed to be 12% in this example. The annual interest of 12% of R450m which equals R54m is a deductible expense from gross operating profit; this means it can be deducted before corporate tax is charged. Secondly we have to consider the depreciation of the building, fittings and equipment. Buildings only depreciate slowly (we assume at 2% per year) with an assumed life of fifty years, but fittings, like carpets and furniture, depreciate more quickly (we assume at 20% per year) with an implicit or assumed life of about five years. Gambling equipment like slot machines and tables also are assumed to depreciate at 20% per year implying a life of around five years. The depreciation on the three categories thus amounts to R8m, R5m and R40m for the building, the furniture-and-fittings and the gambling equipment respectively. This amounts to a total of R53m for depreciation. Along with the interest charge on the bank debt of R54m the deductible charges against gross operating profit are R107m which when deducted yields or gives, a net Operating Profit (before corporate tax) of R111.64m Corporate tax of 28% is then charged on this amount to yield corporate tax of R31.26m This yields a Net Operating Profit (after tax) (NOPAT) of R80.38m in our example. Therefore we can calculate the return on equity for year one.. This is the return on the money invested (the owners invested R225m of equity) is then R80.83m / R225m = 35.7% (R80.83m over R225m which equals 35.7%). This, remember, is slightly less than the 40% we said that Casinos owners are satisfied with, but it is still a very good return on an investment. We are going to move on to an Activity in which you apply the knowledge you have gained to some practical examples. The Activity includes maps of the Western Cape, Gauteng and Kwa Zulu Natal with their existing Casinos. Attempt to account for the differences in the various financial figures. What sorts of factors would you imagine could affect the profitability (and Revenue) of a Casino? Make a list of these and then compare them to those of other groups and note similarities and differences. By now you have been exposed to a great deal of information about some advantages of legalising casinos. You have already written an article for a community newspaper outlining why ultimately legalising a Casino would be generally advantageous. Once you have read through the Activity, decide whether you want t o do it on your own or would like to work with somebody y else. if you decide you want a partner find a like-minded learner to work with. Finally you need to tell your audience what “public benefit” projects you will also fund if you are the successful bidder. When you have all completed your speeches listen to a few of your fellow learner’s speeches and discuss general similarities and differences there might be.